Avnix offers specialized masonry equipment for specific jobs can further decrease the time it takes to finish your task. Mortar tubs, for example, can position mortar right next to the scaffold in quick and safe reach of employees, then moved away and stacked at the end of the day using a forklift. 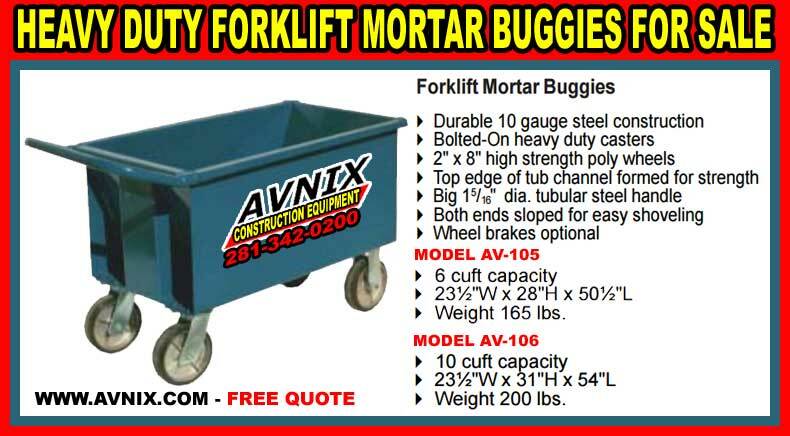 If forklift can not access the part of the wall your team is working on, mortar buggies can be used as way to position mortar and tools into hard to reach spaces that would cause your project to slow down. If personnel are operating at heights over 4.5 or 5”, you may want to think about investing in plaster and masonry stands that elevate gear and tools so employees do not have to bend down to reach them. This helps keep up momentum and reduces the danger of slips and falls that can result when people have to fumble for equipment & supplies. Bigger projects may necessitate use of heavy duty masonry equipment than scaffolds, stands, and mortar tubs. For these applications, you may want to think about using crane forks to move banded blocks or brick pallets. Cranes forks are built with a steady center of gravity that will balance heavy loads and avoid falloffs that could injure personnel or result in material or equipment losses. Model AV-102: 10 cuft capacity ` 24″W x 22″H x 48″L ` Weight 155 lbs. Model AV-103: 6 cuft capacity ` 24″W x 22″H x 32″L ` Weight 121 lbs.